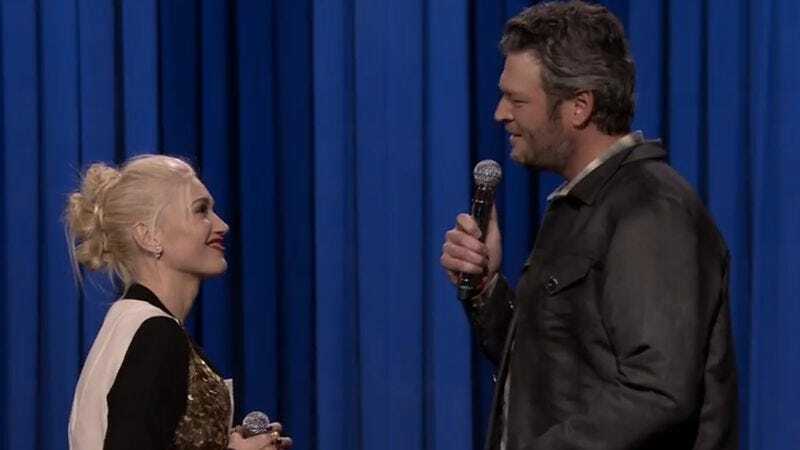 While promoting the newest season of The Voice, Gwen Stefani and Blake Shelton stopped by The Tonight Show for a lip-synch battle. Shelton did his best with props, tap dancing, and a nod to the trailer for The Skeleton Twins, though his face still said “Southern drawl.” Stefani was also unable to shake her performing roots, lip-synching to Carly Rae Jepsen’s “Call Me Maybe,” while looking like the hip-swiveling ska/punk princess she’ll always be. Meanwhile, Jimmy Fallon made some noises, and then a gender-bending duet closed out the contest, with Stefani and Shelton singing “Endless Love” by Lionel Richie and Diana Ross for the win. It’s an honorable mention at best in a world where Emma Stone demolished Fallon at this very game earlier in the year.